River Edge Green Team In Action! We loved seeing this video created by River Edge Green Team from their most recent collection. So fun to see a collection in progress! Unsubscribe from: Blog item: River Edge Green Team In Action! Citi Volunteers Make It Happen! 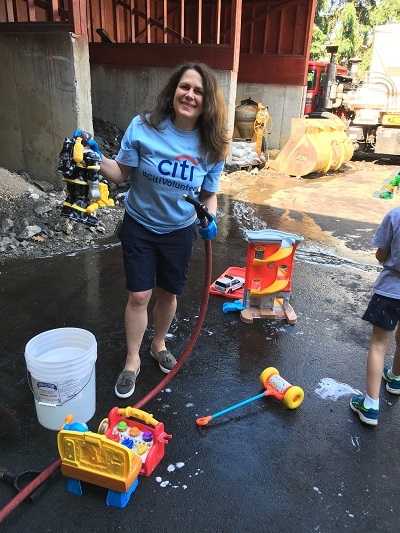 On June 9th, Citi celebrated their Global Community Day, in which employees all over the world are offered opportunities to participate in a day of service. Second Chance Toys was thrilled to be selected this year as a non-profit partner organization. 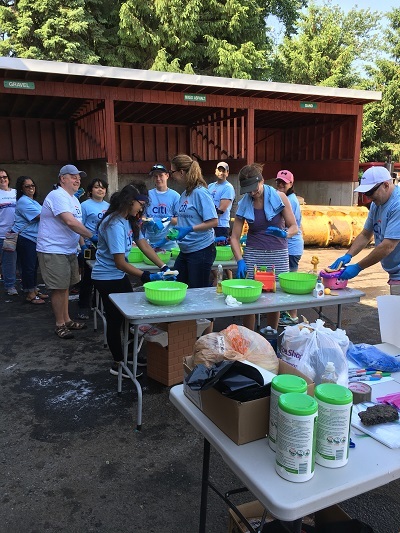 Sharon Den, Program Manager, Employee Engagement noted, "This was a great activity for our New Jersey-based employees to participate in along with their friends and family. Many of the volunteers brought along their children, who also benefitted firsthand from the life lessons of giving and reuse." 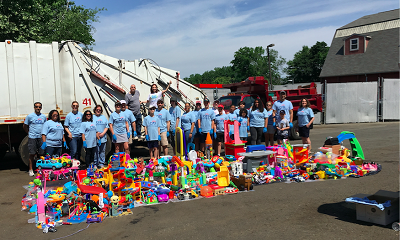 Second Chance toys had 22 Citi Volunteers sign up to clean 900 gently used plastic toys collected by Paramus Department of Public Works throughout the year. In three-hours' time, volunteers sorted, inspected and cleaned the toys to good-as-new condition. They then bagged them all up to be readied for transport by 1-800-GOT-JUNK? to the local organizations that care for children in need. Unsubscribe from: Blog item: Citi Volunteers Make It Happen! Our ongoing series of #ToyTales goes beyond the day of toy drop-off and takes a look at how donated toys change the lives and outlook of those who receive them. Today's Toy Tales is about Freedom House/Barrier Free Living NYC, a fully accessable domestic abuse shelter for families and individuals. 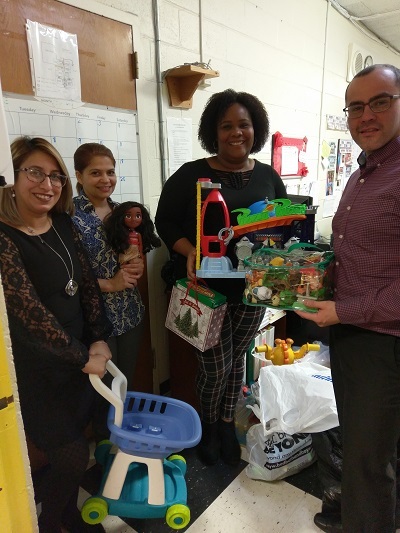 Childcare specialists and social workers at Freedom House/Barrier Free Living NYC were elated to receive a beautiful donation of toys to use with the children. "The toys have impacted children in a very positive way." stated Yenely Gomez, MSW and Director of Child Care/Recreation at Freedom House. "Through use of the toys and play, the children can express their feelings more easily about domestic violence in the family. Additionally, we sometimes have families that come to our facility with nothing, just the clothes they are wearing. Having some toys available to play with is both welcoming and comforting for the new children." 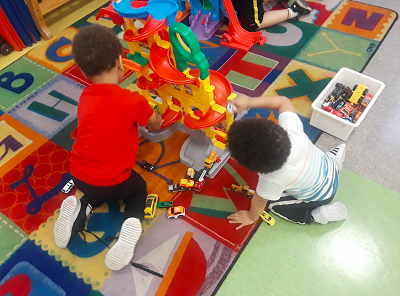 Childcare specialist, Alva Ross, also noted, "We have a lively group of boys who are really enjoying the race track and cars donated. The children are using their imaginations to create car races or car pile ups. The older children, girls included, are enjoying racing the remote-control car around the childcare room. They have had to take turns sharing the car and have been kind and generous in doing so." She adds, "The children are benefiting through imaginative play and learning teamwork skills with these wonderful toys." 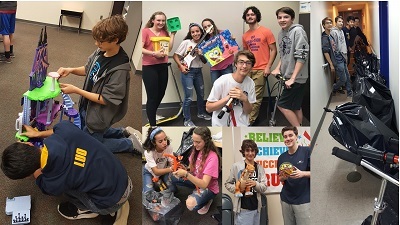 Our recent outreach has resulted in more recycling centers and green teams stepping up to conduct gently used plastic toy collections! 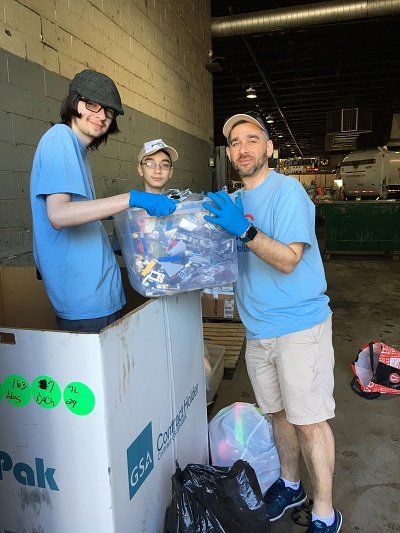 Fair Lawn Recycling Center and the River Edge Green Team have been collecting for years and serve as proven model programs that keep thousands of toys out of our landfills and allow us to reach many more children. Because of the strength of these programs, we are now beginning to attract interest from other towns. And why not? The benefits are real, and there is no reason why toys should be tossed, when so many children go without them. 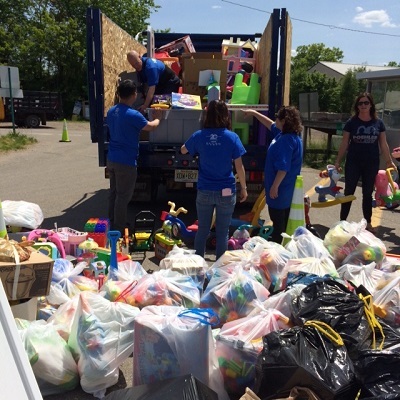 While the Green Teams inspect, sort and clean the toys they collect, Second Chance Toys will bring in volunteer teams to do the same at the recycling centers. We then match up their huge collection with multiple local organizations that serve children in need and arrange for transportation of the toys. Rose & Rex is thrilled to have worked in partnership with Second Chance Toys for the past two years. 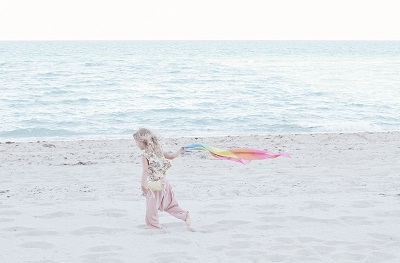 As a teacher founded and curated brand, we believe that play is the single most important developmental tool young children have. Play is a right, not a luxury. 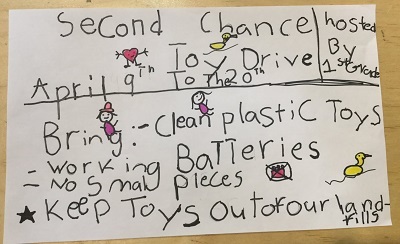 All children should have the opportunity to play in a healthy world, which is why we are so committed to Second Chance Toys’ mission to provide toys to children in need and reduce plastic waste. Through our #PlayItForward Initiative, every purchase on Rose & Rex allows us to support Second Chance Toys in their efforts to rescue, refurbish, and donate toys to children in need. 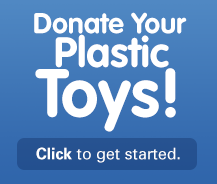 In addition to donations made possible through product sales, we have sponsored events and toy initiatives to increase visibility for the work that SCT is doing, and to encourage families to donate their used plastic toys. A highlight of our partnership was a toy collaboration between Rose & Rex and Hazel Village, in which we created exclusive “give back” stuffed animals to benefit Second Chance Toys. 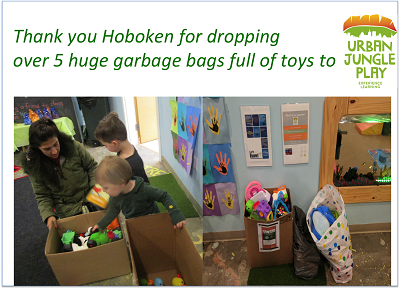 This spring, Rose & Rex and Second Chance Toys sponsored a collection event with Finally Home Jersey City. 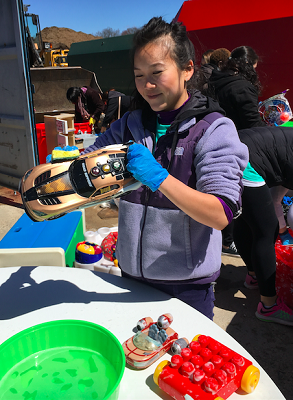 Families were invited to a fun-filled day of play where we collected many used plastic toys, which were then donated to local families in need. We look forward to continuing to support Second Chance Toys and their work of bringing play to all children, regardless of circumstance. Once again, Second Chance Toys benefitted from Viacommunity Day, a day in which Viacom volunteers all over the globe perform community service. 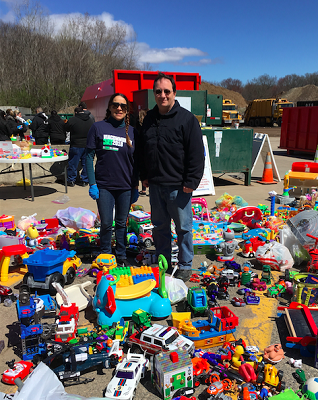 On April 20th, a team of 30 volunteers headed to Fair Lawn Recycling Center in New Jersey, where 1,000 toys had been collected for Second Chance Toys and were waiting to be cleaned and donated to children in need. The team, led by captain Wanda Farag, hit the ground running. In 3 hours they managed to sort, inspect, clean, and bag the toys that were sparkling clean and ready again for play. 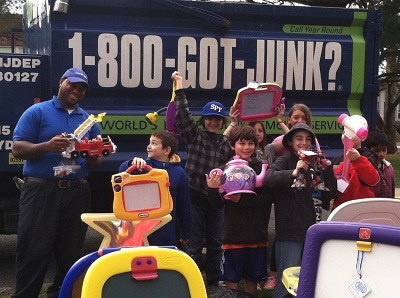 The many bags of toys, were then loaded on the two 1-800-GOT-JUNK? trucks to be delivered to five local organizations that very day. "It is so gratifying to see the huge impact we can make and all in just a few hours," noted Farag, who has been a Viacom volunteer with Second Chance Toys since 2013. 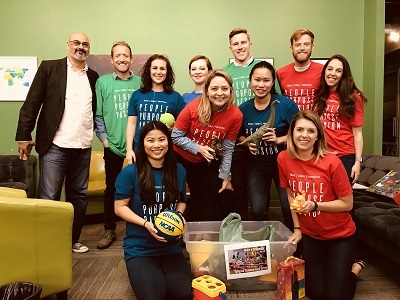 The Viacom volunteers not only helped children and the environment, but the camaraderie, teamwork and new acquaintances, made in a setting outside the office, surely added to the multiple positive outcomes on Viacommunity Day. Having such a longstanding relationship with Viacom has meant a lot to Second Chance Toys. 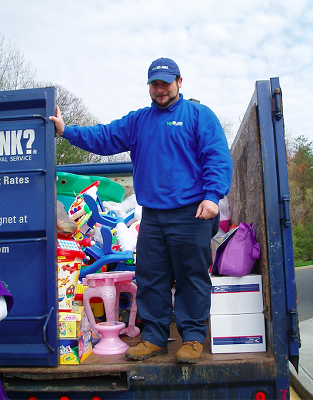 As a result of the last 6 years of participation, over 8,000 toys have been donated and over 32,000 pounds of plastic have been kept out of our landfills! Second Chance Toys is most grateful to be included in this wonderful endeavor every year and we are thankful for Viacom's support and generous grant. 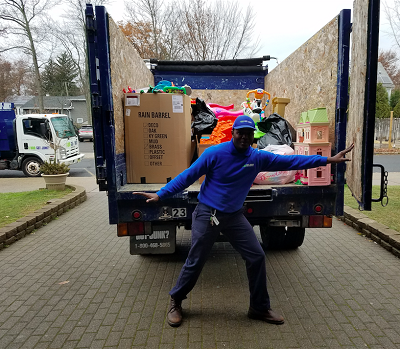 Booz Allen Hamilton's Earth Month Collections Keep Growing! 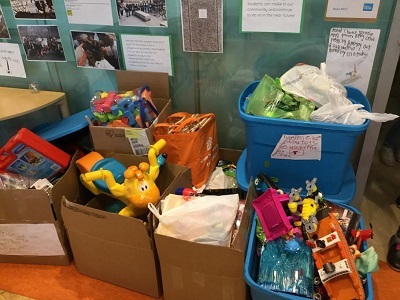 In 2015 the Sustainability Program Management Office (PMO) at Booz Allen Hamilton, a technology and management consulting firm, coordinated and conducted their first collection of gently-used plastic toys at their McLean, VA headquarters. Since then, enthusiasm for the program has continued to spread to its many offices throughout the United States. 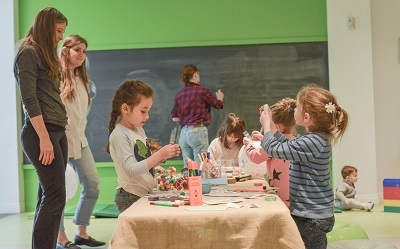 Now in its fourth year, involvement surpassed all expectations, with 21 different collections taking place in 10 different states plus the District of Columbia. As a result of the coordinated effort, nearly 2,000 toys were collected and donated to 21 organizations around the country. In order to conduct a program this size, it took the coordinated efforts of several dedicated individuals at Booz Allen. Harika Dyer, Booz Allen’s sustainability project manager, led the internal coordination team. Melinda Ali, executive assistant, and Phoebe Stinson, associate, managed the participating offices while Sherry Marin Altman, vice president of the firm’s Innovation and Growth Strategy, provided guidance based on previous participation. 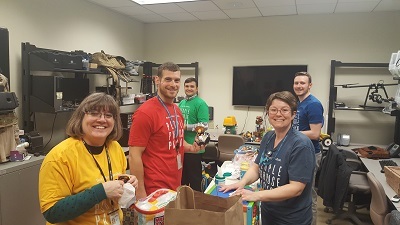 "We really focused our efforts this year on promoting this community service opportunity by reaching out to the various offices and internal groups within Booz Allen," remarked Dyer. "As a result, participation grew exponentially this year and we had offices represented coast to coast!" Each office took a unique approach to their collection of gently used plastic toys. Some decorated and placed their collection boxes in visible areas around the office; some coordinated their collection and cleaning efforts with the Take Your Children to Work Day initiative; others involved their childcare programs to collect; and still other offices went as far as dividing into teams to create some friendly competition. No matter the individual strategy that each office employed, the results were a resounding success! 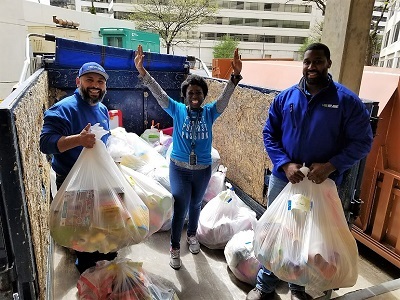 Second Chance Toys is very grateful for the enthusiasm and camaraderie that is clearly on display at Booz Allen during Earth Month. Additionally, we are most grateful to the firm for recognizing our mission with a very generous grant. Their generosity continues to help us generate programs in support of disadvantaged children and the environment. Thank you Booz Allen Hamilton! Unsubscribe from: Blog item: Booz Allen Hamilton&#039;s Earth Month Collections Keep Growing! Quantity of toys you received- 706 toys! 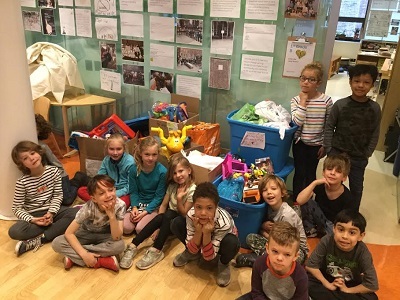 Temple Sharaay Tefila, in NYC, has been dedicated to collecting toys with Second Chance Toys for both the holidays and Earth Month. Over the years they have donated many thousands of toys and have certainly impacted positively children in need and the environment. This past holiday, they collected over 500 toys that were donated to Mt. Hope Housing in the Bronx. Pictured are staff from Sharaay Tefila who helped load up all the collected toys, representatives of Mt. Hope Housing with a beautiful Miss Kitty Kitchen, one of over 500 plastic toys delivered along with 3 beautiful bicycles transported by 1-800- GOT-JUNK?, who consistently volunteer their services to help Second Chance Toys with our large collections. Thank you all for making the holidays bright for so many children and families! For kids to get the most from their toys, you have to make a conscious effort to select the best ones for them. This is because toys play an important role in your children’s growth, well-being, and happiness. Toys can help younger kids develop both their fine and gross motor skills. This, in turn, will enable them to explore and understand the world around them better. These skills will also help with their cognitive development. Hand-eye coordination is a skill crucial for writing, drawing, playing sports, etc. Plastic and wooden toys that have to be constructed and sorted are great for improving this skill. These toys also improve their problem-solving skills and will enable them to feel happy whenever they are successful. Toys that enable children to engage in pretend play will allow them to socialize and interact with you, other kids and adults. These skills will help them understand the importance of communication, cooperation, and connecting with others. Lastly, action or reaction toys that pop up or make a sound when touched are effective in making toddlers and younger kids laugh and feel happy. They also improve their dexterity and understand the important idea of causality. Whether you’re getting brand new or used toys for your children, choose ones that will have positive effects on their growth and development. Sreeya Patil Wiesner is the founder of EcoToys in Dubai, UAE. She started her online toy store with an aim to provide healthy, safe and eco-friendly wooden toys to kids 0-6 years of age in the UAE. PS 186 in Queens, NY loved working with Second Chance toys again this year and surpassing our collection goals! 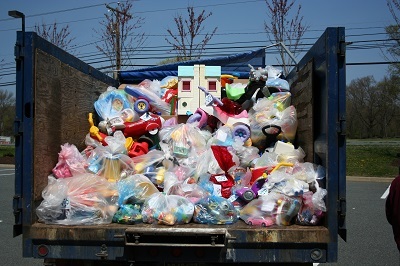 Our students worked hard to collect and clean over 650 toys to get them ready throughout the collection week. The administration, teachers, and families at our school donated generously to support the kids in our community. 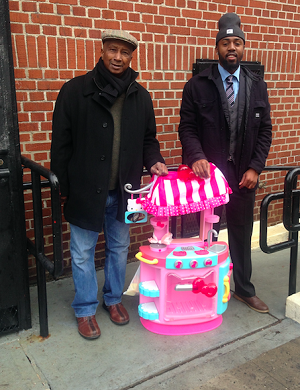 Toys went to Cienfuegos Foundation and the Jamaica Children's School (PS 312) both in Queens. We look forward to working together again next year! Over 70 gently loved toys were collected by the Saddle Brook Daisies and donated to Greater Bergen Community. So that other children could fully enjoy the toys, the troop made sure the toys were clean, plastic, had no missing parts and the batteries were operational,. 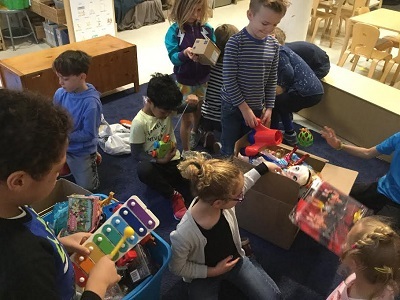 While the children at Greater Bergen were the beneficiaries of these good-as-new toys, the Daisies were the beneficiaries of a valuable learning experience in helping others less fortunate. 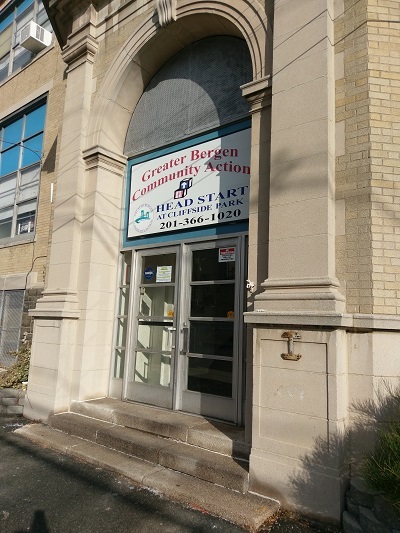 Accepting the toys are members of the Greater Bergen Community Action Program Cliffside Park team. 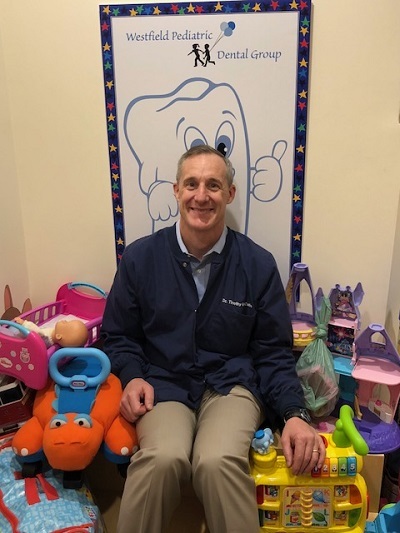 Over the many years that Westfield Pediatric Dental Group has been collecting toys with Second Chance Toys, they have kept thousands of plastic toys out of the landfills and put them into the hands of children in need. 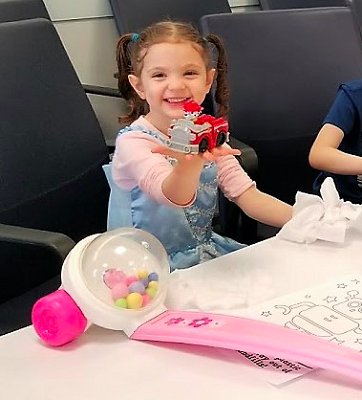 We have been able to count on their support year after year, and we are so grateful for the beautiful toys that have been given a second chance to bring smiles and learning to so many children. Pictured is Dr. Timothy McCabe with some of the toys they collected in December to benefit United Community Corporation in Newark. Thanks to the kids and leaders of Cub Scout Pack 20 in Closter-Demarest​, NJ for their toy collection. Children at the Aposotolic Church in Newark were able to select from the toys to make their holidays brighter! A family counselor from the New York based Coalition on Adoptable Children knew that her client was worried that her daughter was not yet walking. 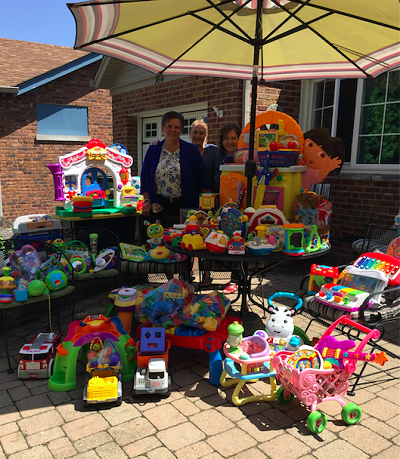 So when her client was able to move to an apartment in which she and her daughters no longer had to share a bedroom, their family counselor brought over a few Second Chance Toys as a housewarming gift. One of the toys was an Activity Walker. The one year old immediately gravitated towards that particular toy when the family counselor arrived. The activities on the walker drew her in and she remained playing with it throughout the visit. About a week later, the family counselor received a phone call from her client who had some exciting news that she wanted to share – with assistance from the walker toy, the one year old had taken her first steps! We should never underestimate the power and importance of toys and play.